No matter how rhapsodic I wax about my city, there are times when it's imperative to just get out. The apartment walls feel like they're inching closer every day, the city's patina looks more like filth than age-old wisdom, and my ability to deal with a full workload, dates with friends and Ben, and the semblance of an inner life flies completely out the window. As luck would have it, an escape lies just up the Hudson River. From time to time, when life in the big city overwhelms us, or when someone's birthday needs celebrating, we pack up our bags, zip to Grand Central and ride up along the river to Beacon, where Ben's mother lives. From the back bedroom that we claimed this weekend, I could lie awake at night and hear the distant whistle of the train, raising some ancient wanderlust, and in the morning faint chirping readied me for the day. Leisurely meals around the dining table, rousing games of Uno!, and a sunny walk down Main Street where I alternately kept my eyes peeled for Pete Seeger and dreamt of renting out one of the many storefronts to open a bakery or restaurant, were some of the best parts of the weekend. 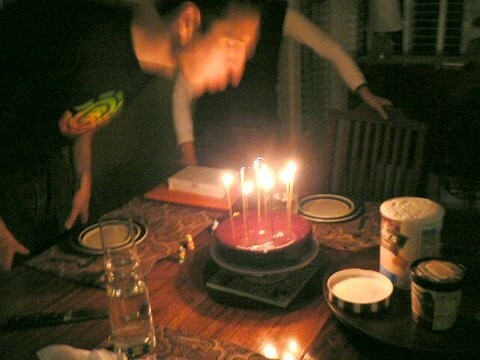 But best of all was celebrating Ben's birthday with his family (though one crucial Spaniard was missing). Nigella Lawson's article on easy baking in the New York Times several months ago proffered up a recipe for a cocoa-flavored banana cake covered with chocolate icing, fusing two of Ben's favorite things - bananas and chocolate. With high hopes after other Nigella successes in my kitchen, I figured I'd found the perfect cake for Ben, and so I packed up my springform, a bloc of Valrhona and a clutch of browning bananas before our ride upstate. It must have been Murphy's Law that on such an occasion, I was totally disappointed by the results. The cake's crumb was dry in some spots and leaden with wet bananas in others (looking more like fruitcake than birthday cake). The cocoa flavor was masked by the large amount of mashed bananas and the rustic texture of the cake clashed entirely with the elegant and fruity icing (of which there was far too much - I poured the smooth and glossy leftovers into a pitcher to eat over ice cream). I kicked myself for not making Molly's well-tested and spectacular banana cake instead. Ben and the others, being both darlings and sweethearts, ate their slices gamely (even taking seconds, with vanilla ice cream valiantly gussying up each plate) and Ben's mother asked for the recipe, so it wasn't an unmitigated disaster. But I'd never make it again. I don't agree with Nigella that anyone can be proficient as a baker - and perhaps that's where the problem lies. Nigella created the recipes in that article for novice bakers - and I think she did them a disservice. Baking is more difficult than making a stew - it does require more effort, a lighter touch, a bit of reverence in the kitchen. Why should novices settle for instant gratification rather than delicious results (and though she calls this cake sophisticated, I beg to differ)? Becoming a good baker takes practice, failure, and run-ins with bad recipes. One newspaper article that promises spectacular results with a dollop of sour cream and a devil-may-care attitude isn't going to do the trick. 1. For cake: heat oven to 325 degrees. Oil or spray a 9-inch springform cake pan and set aside. In a large saucepan over low heat, melt butter with olive oil. Remove pan from heat. 2. Add flour, baking powder, baking soda, cocoa and sugar. Mix well. Add sour cream and mashed banana, and whisk to combine. In a small bowl or pitcher, whisk together vanilla extract, eggs and salt. Add to saucepan and whisk until smooth. Pour into cake pan. 3. Bake until a cake tester inserted into center comes out clean, about 45 minutes. Allow cake to cool on a rack for about 15 minutes, then remove springform and allow cake to cool completely before icing. 4. For icing: In a medium saucepan, combine cream, chocolate and corn syrup. Place over low heat, stirring gently with a spatula to avoid creating air bubbles, until mixture is very smooth. Place cake on a stand or a plate and spread icing over it with spatula.